7 Magic Islands is proud to welcome Cressida Cowell to our Wizards of Words blog. Cressida is the creator of the acclaimed How to Train Your Dragon series. 2014 has been an epic year for this British author with a new Dragon book coming out in June, a second movie adaptation of her most famous series being released in July, just to name a few of her most recent accomplishments. 7 Magic Islands: While you are best known for your How to Train Your Dragon series, they’re not your first venture into the world of the printed word. How did you get your start writing? Cressida Cowell: When I was 8 or 9 years old, I started writing short stories and I haven’t looked back. 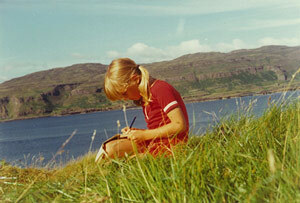 I entered a writing competition when I was 9, and amazingly, I won! It was from that point I had the confidence to go after my dream of being a writer. As for my first published book, it came out when I was 33 years old: Little Bo Peep’s Library Book, a picture book. 7 Magic Islands: We adore picture books here! Having such an early start as a writer, you must have read a lot when you were a kid. What was your favourite book? Cressida Cowell: My favourite book was The Ogre Downstairs by Diana Wynne Jones. I used to read this book to my younger siblings, my little cousins – I would read it to everybody and anybody! I read the book to my own children, and it’s stood the test of time; they love it now just as much as I did several years ago. 7 Magic Islands: It sounds like a true classic! As we understand it, the world of children’s books can be difficult to break into most of the time. What was your journey like when it came to publishing your first book? Cressida Cowell: In university, I studied English and took and M.A. in Narrative Illustration at Brighton. There was a competition at the time called the Macmillan Children’s Book Competition, and I won a Highly Commended award. At the awards ceremony, I met an editor, who helped publish my first book, Little Bo Peep’s Library Book. In short, it was a very lucky break! 7 Magic Islands: That’s amazing! Speaking of your publications, let’s talk about your most famous works thus far – the How to Train Your Dragon books. Often, authors will draw upon real-life places when setting their books. Where did the Isle of Berk come from? 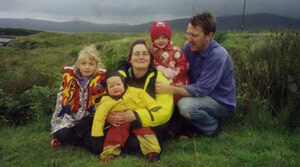 Cressida Cowell: When I was a child, my family used to spend many summers on an unnamed, uninhabited island off the west coast of Scotland. On this island, there were no roads, no houses, and no electricity…except the small stone house my family built when I was 8 years old. We spent the night in that house by candlelight, and my father would tell us stories and legends of Vikings who invaded the isles centuries ago and rumours of dragons who to this day may still dwell in the caves and cliffs of the island. From there, Berk was born. 7 Magic Islands: Now that sounds like a magic island we should visit some day! As for the inhabitants of the Isle of Berk and the How to Train Your Dragon universe, what or who inspired the main character, Hiccup? Cressida Cowell: Hiccup is 11 years old when the books begin. When a child is 11, it’s an intriguing age; they’re starting to take their first steps into adolescence and an identity of their own. It’s during those early years they start to form the adult they’re going to be. It’s hard because Hiccup, first of all, doesn’t really fit in with his peers and he finds it difficult to reconcile his differences with his father; he has to find his own way, to be himself, and that’s no easy task. With that said, Hiccup was inspired by everyday pressures of kids that age. Though Hiccup doesn’t live in the same universe as you and I, the issues children face in that world translate into our world, too. 7 Magic Islands: The more relatable the character, the better. Continuing on How to Train Your Dragon, the series has leapt off the page and into theatres, courtesy of DreamWorks Animation, a claim so few writers can make! How did your book series become a film? Cressida Cowell: When it first happened, it very much took me by surprise! DreamWorks Animation contacted my agent out of the blue. I wasn’t expecting there to be film interest in the states; I had a bit of television and movies interest prior to DreamWorks’ approach, but I declined. It’s not easy to have something so close to your heart optioned. If I was going to option my work, it needed to be something really special. DreamWorks was interesting, so I took the risk. 7 Magic Islands: And we’re so glad you did! In 2014, the sequel, How to Train Your Dragon 2, was released. What are your thoughts on the sequel? Cressida Cowell: DreamWorks is doing an amazing job on the trilogy. Screenwriter/director Dean Deblois and producer Bonnie Arnold worked for four years to make sure the sequel was exactly as good as the original movie. The whole cast and crew returned for the sequel, which was wonderful! The new movie is stunning and the best animation I’ve ever seen. It deserves every bit of its fantastic reception. 7 Magic Islands: Congratulations on such a success! 2014 has been a particularly amazing year for you; in addition to a second successful How to Train Your Dragon movie, you released the newest instalment of your Dragon series, The Incomplete Book of Dragons. Can you tell us a bit about the newest book? Cressida Cowell: Absolutely. For the first time, the dragons in my series will be illustrated in colour and will feature brand new dragons in addition to the ones we already know and love. 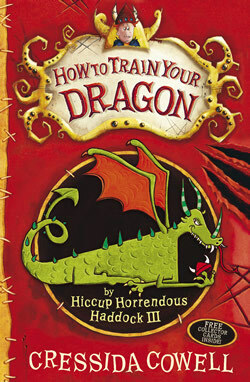 The book is comprised of notes from Hiccup Horrendous Haddock III as a dragon-watcher. The information inside features dragon profiles, riding tips, and so much more! 7 Magic Islands: That sounds so intriguing! Your artwork, as we understand it, has been featured elsewhere in London. Can you tell us about the BookBench? Cressida Cowell: This summer, my How to Train Your Dragon BookBench was in London. I illustrated the bench as part of the National Literacy Trust’s Books about Town project. The bench itself looks like an open book. I’m one of 50 artists and authors involved in the project to celebrate literacy and London’s literary legacy. The funds raised from the project will combat low literacy levels. 7 Magic Islands: You mentioned you do quite a bit of work with the National Literacy Trust. Please, expand upon your role with the organization! Cressida Cowell: I am a celebrity ambassador with the NLT, and I work to improve reading, writing, speaking and listening skills across the UK’s most disadvantaged communities. I recently launched the NLT’s 11th Premier Leagues Reading Stars Program with football star Frank Lampard. 7 Magic Islands: The NLT is certainly devoted to a worthy cause. We noticed you’re also involved with the Children’s Media Foundation as a founding patron and a supporter of the Reading Agency. What can you tell us about those organizations? Cressida Cowell: The CMF is devoted to ensuring the quality of the content of today’s media available for children. We want the media our children consume to be responsible, varied and informed. The Reading Agency helps encourage reading through Summer and Christmas Reading challenges, which not only spurs children on to read more, but it helps children discover the sheer joy and fun reading offers. 7 Magic Islands: There’s nothing more rewarding for a child than a good book! How else are you involved in educational and reading programs for children? Cressida Cowell: This year, I’ve appeared at major literary festivals, including opening a children’s and family program at the Hay Literary Festival. Last year, I held a live streaming event for classrooms, which I plan to repeat this year. Last year, I reached more than 30,000 schoolchildren. This year’s live streaming event coincides with Dragonese Day 2014, which is a British initiative providing teachers with educational resources on Vikings and using my books in the classroom. 7 Magic Islands: It must be so exciting being so directly involved in literacy and education! Turning from your books for a moment, tell us a little bit more about yourself! Cressida Cowell: I was born in London and I still live there. I’m married to Simon Cowell – no, not that one! – and I have three children, Maisie, Clemmie and Alexander. 7 Magic Islands: Thank you so much for taking time to answer our questions! We’ll conclude the interview with a 7 Magic Islands tradition – How do you encourage kids to read more? Cressida Cowell: I encourage my children to read by reading aloud to them, even when they can read themselves. I find that books parents read to their children are the books that stay with them for their entire lives. 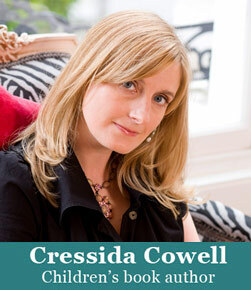 You can find out more about Cressida Cowell and her work online at www.cressidacowell.co.uk!